I went camping over the last few days and one of my favorite parts of camping is the campfire cooking! Something about an outdoor campfire adds such a unique and tasty flavor to any meal. 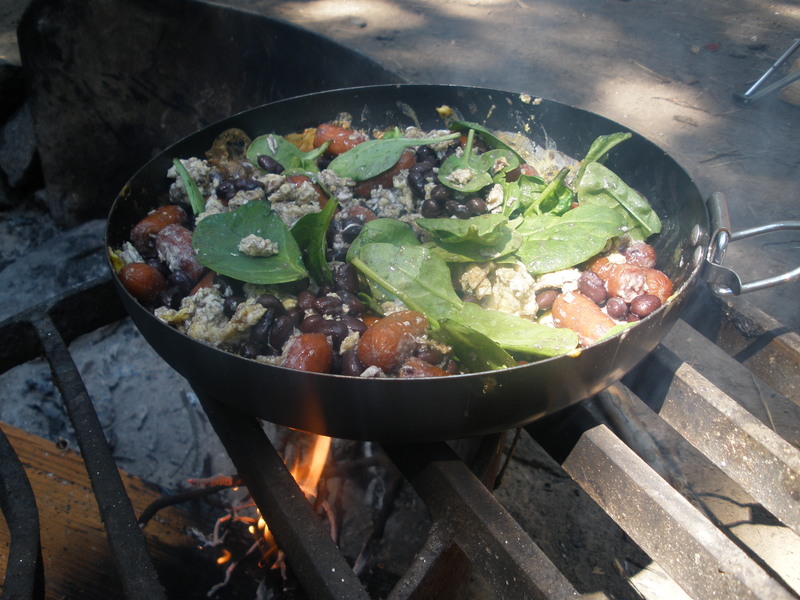 Here is an easy gluten-free breakfast camping recipe that’s packed with protein power (to get you through those amazing hikes and nature adventures). Make a campfire (make sure you have paper, twigs, wood, and a lighter). Here’s a link on How to Build a Campfire. Once the fire is hot and steady, place a pan on the grill and add olive oil. Add pre-cooked sausage. Stir and heat for 3 minutes. Crack 5 eggs in pan, stir around to make it scrambled. Let eggs cook for 2 minutes. Add black beans (drain water from can). Stir constantly (don’t break the beans). Once eggs are cooked, add a handful of spinach. Heat for another minute then serve with salsa or Tapatio sauce!